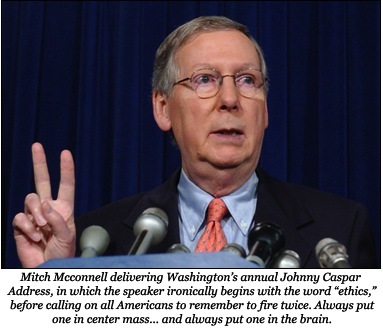 Now, it would be easy to stop at hoping to see someone whaling fist-wise on McConnell's smug face, but that's not how we do things here. If anything, we have a foolish dedication to relentless, unhealthy completism. That's why, when people like me were only too happy to nod off on the couch to Netflixed TV series, our intrepid Managing Editor General Rehavam Ze'evi took to Twitter to personally insult every Senatorial shitsack who voted to kill even a moderate gun control bill amendment. He does the work so you don't have to. Many thanks to Twitter user @Vrunt for creating this Storify. Enjoy.